Municipal bonds have traditionally given investors a reliable investment while providing state and local governments with an essential tool for funding public infrastructure projects. Now, the threat of municipalities defaulting and dramatic changes to the muni market’s fundamental operations have created an attractive hotbed of opportunity for today’s top institutional investors. Investing in Municipal Bonds is the retail investor’s road map to the lucrative market that is fueling the digital and physical highways of the future. Only Dr. Philip Fischer can offer such a brilliantly practical amalgam of big-picture financial theory and nuts-and-bolts bond calculations. His crystal-clear explanation of the muni market covers every aspect, including the various “personalities” and traits of different types of bonds. 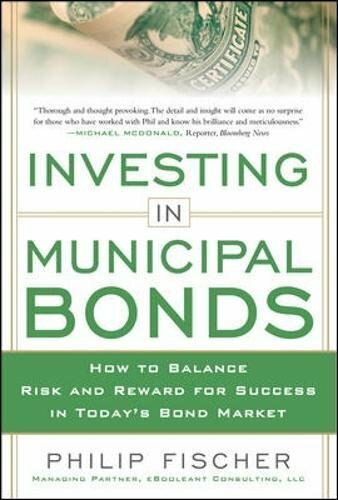 His hands-on strategies for earning more from your money will keep this book at your fingertips as you customize a profitable municipal bond portfolio to achieve your financial goals. Political and business leaders as well as financial professionals seek Dr. Fischer’s knowledge and firsthand insights into municipal securities, from day-to-day trading to milestone events like the 2008 financial crisis. Bond yields will eventually rebound from these historic lows and bring increased risk. Investing in Municipal Bonds will give you the knowledge you need to adjust your risk and balance profi t for continued success toward your financial goals.